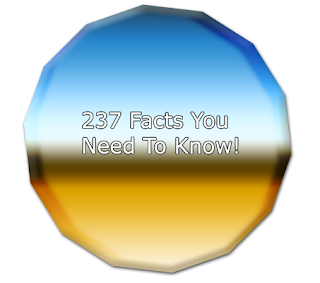 It's a little known fact that to get by in life, one really only needs to know 237 facts. Of those 237 facts, you can actually get by on 236 of them, as the last fact, #237, is simply that you need only know the first 236 facts. So, in a matter of speaking, that is the 237th fact. Because this one is supplementary, I've included a bonus fact for today. Study it well as you're sure to need it in life. The phrase "I don't give a damn" originally referred to an Indian coin called a "dam" valued at a 1600th (Some studies say it's a 64th or 40th, though the story's otherwise the same) of a rupee. It was literally the least amount of money one could give and was essentially worthless. Thus saying I don't give a dam is stating the thing in question has zero value. Good people that we English speakers are, gave it that sweet old N at the end. So kids, feel free to express your distaste for something by using this expression. When you're parents scold, tell them you don't mean dam with an N.
Parents around the world now thank you. Parents love me. Wait till I give their children nightmares with the origins of 'running amok'. I'm sorry, I MISSED 235 other facts??? Nope, you're good. Counting down to the number one fact you need to know. I can now accurately describe how I feel about this post...ha! That reminds me of when me and my cousin were kids we would say 'Beaver Dam' instead of just 'Damn' and thought we were so clever. Actually, I think I could have gotten through without # 236 as well. I've had that phrase said to me my whole life! Now I know where it came from. This is why I love it here! I can quit school and come here instead. Heck, I'm going to take my kids out of school also! I'm looking forward to learning even more! Or, when their parents scold them they could just say, "No really. I don't give a dam." But that might not end well.